There’s something satisfying about indulging in the eating and drinking traditions associated with certain holidays, like deviled eggs on Easter, pumpkin pie and turkey on Thanksgiving and, of course, green beer on Saint Patrick’s Day. March 17th marks the day that has transformed from a quiet religious holiday to the world’s biggest green party. On this Irish holiday, people from all walks of life come together to celebrate friends, family and good times. 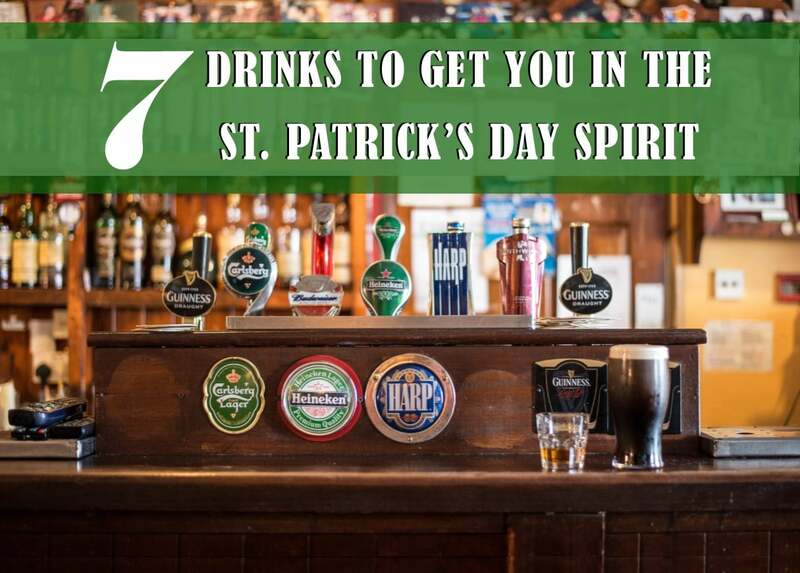 Looking to imbibe the best of St. Paddy’s Day? Here are seven drinks that will help get you in the mood for the festivities. It doesn’t get any more Irish than Guinness. 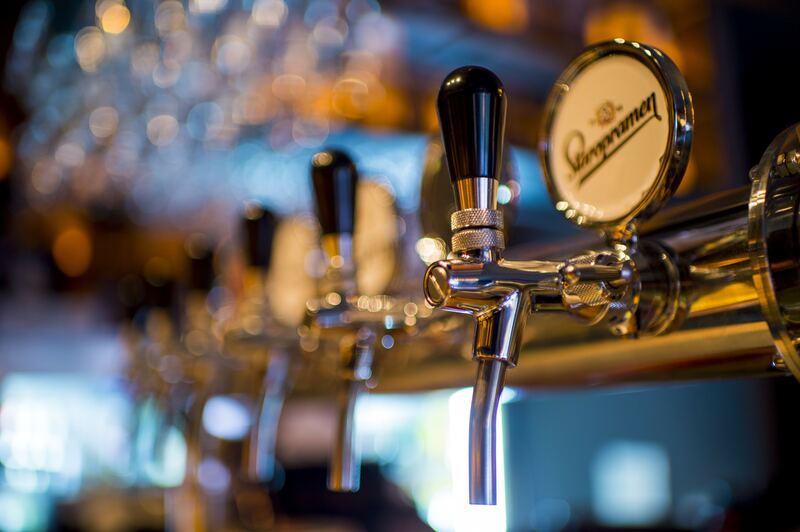 Dublin’s historic Guinness brewery is the king of beer. According to Reader’s Digest, twice as much Guinness — 13 million pints to be exact — is consumed each year on Saint Patrick’s Day than on any other day of the year. Its flavor is creamy and complex with notes of coffee and malt. The taste of this beer is heavily affected by how it’s poured. Make sure it’s done by someone who knows how to master the perfect pour. To take your Guinness consumption to the next level, why not try mixing both light and dark beers to create the Black and Tan? To prepare a Black and Tan, the proper glassware is key. First fill a pint glass halfway with pale ale, and then pour the dark beer, such as Guinness, on top. Pour slowly to avoid mixing the layers. While the two beers have different densities and will stay separated in the glass, they’ll mix as you drink them, creating a unique taste experience. In Ireland this drink is known as a “Half and Half”. Not into drinking whiskey straight? Have no fear. Consider the hot toddy instead. Served warm, this traditional Irish drink (also known as a Hot Irish Punch) features a mix of honey, Irish whiskey and water. 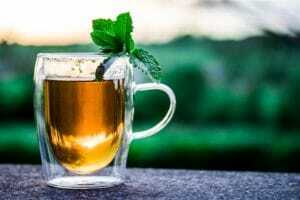 There are thousands of variations and recipes online, including using tea instead of water or adding a slice of lemon. Hot toddies can even used as a cold remedy. 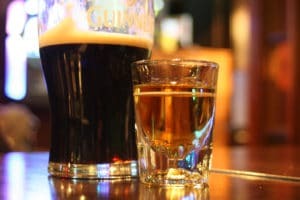 While the Irish Car Bomb is admittedly an American creation, it does include three Irish beverages. More of a task than a traditional drink, it’s certainly not for the faint of heart! To begin, fill a pint glass halfway with Guinness. Then take a shot glass and fill it halfway with Jamison Irish Whiskey and the rest with Baileys Irish Cream. Next, take the shot glass and drop it into the beer glass. It’s then customary to chug the concoction as quickly as you can. Left to sit, the Bailey’s will begin to curdle and form chunks, so the goal is to down the drink before that happens.